"Graphene-Based Thermopile for Thermal Imaging Applications"
Movies such as 1987’s “Predator,” in which an alien who sees in the infrared hunts down Arnold Schwarzenegger and his team, introduced a generation of sci-fi fans to thermal imaging. Since then, heat-sensing devices have found many real-word applications but have remained relatively expensive and rigid. But a new development featuring graphene, reported in ACS’ journal Nano Letters, could lead to a flexible, transparent and low-cost infrared vision system. The concept of humans — or aliens — having the power to see in the infrared to help fight enemies in the dark has been around for decades. Technology has allowed real-life military, police, firefighters and others to do their jobs successfully at night and in smoky conditions. It also helps manufacturers and building inspectors identify overheating equipment or circuits. But currently, many of these systems require cryogenic cooling to filter out background radiation, or “noise,” and create a reliable image. This approach, however, complicates the design of these imaging devices, and adds to the cost and the unit’s bulkiness. Tomás Palacios, Pablo Jarillo-Herrero and colleagues wanted to find a more practical solution. 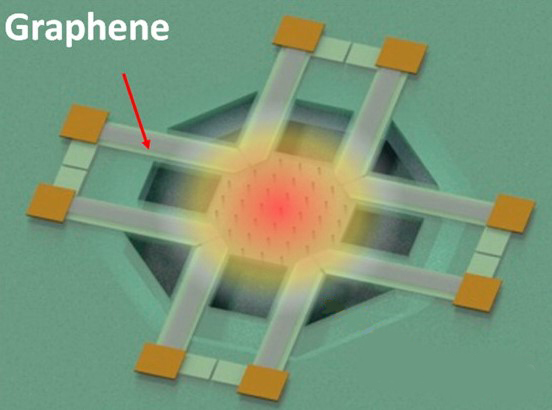 The researchers integrated graphene with silicon microelectromechanical systems (known as MEMS) to make their device. Testing showed it could be used to detect a person’s heat signature at room temperature without cryogenic cooling. In the future, advances could make the device even more versatile. The researchers say that a thermal sensor could be based on a single layer of graphene, which would make it transparent and flexible. Also, manufacturing could be simplified, which would bring costs down. The authors acknowledge funding from the MIT/Army Institute for Soldier Nanotechnologies, the U.S. Army Research Laboratory, the Office of Naval Research, the Solid State Solar Thermal Energy Conversion Center (MIT), the MIT Center for Integrated Circuits and Systems, the Air Force Office of Scientific Research and the National Science Foundation. A thermal sensor made out of graphene could lead to better night vision technology.